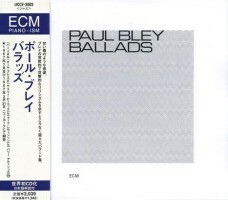 Paul BLEY: Ballads. Bley (pno); Gary Peacock, Mark Levinson (bs); Barry Altschul (perc). ECM UCCE-9285 (available in Japan from April 8 to June 20, 2015). CD Japan (http://www.cdjapan.co.jp/) and ftfym65 (on eBay, Facebook and Twitter) are reliable sources. Reissues in Japan often exhibit a short life. This influential album hit CD 15 years ago, but only on the Japanese market, and will now appear there (briefly!) in SHM-CD attire. I reviewed that first CD version. Naked instrumental rôles and obstinate despair – Ballads could be jazz’s version of the late Shostakovich quartets. That isolation is emphasized when each player takes a different tempo. Altschul’s restless, shuffling beat seldom drives events, and his focus on cymbals and snare fits the bare textures. “Ending” comes first, lasts 17:20 and resists resolution. Familiar Bley patterns – jagged phrasing, leaping intervals, plentiful pauses – wander, and awaited climaxes never arrive. Bass and drum solos (i.e., Bley’s absence) don’t quell the anxiety. With its opening tumult, gleaming shards, and rising, abrupt close, “So Hard It Hurts” (12:13) conveys an odd trajectory. The pianist sits out the middle section, for a lengthy bass / drum dialog, then a rapid-fire Altschul solo. Between these pylons stands “Circles” (2:59), more cutting than either. As Bley repeatedly laps the melodic circuit, one imagines “a raw destructive brain that pushes itself trying to get it right” (as Benjamin Weissman wrote of Bernhard’s novel Concrete). Not everybody embraced the aesthetic. At least guitarist Eugene Chadbourne dismissed it with some humor.